The identity of the buyer of the letter written in 1978 by the late AC/DC singer Bon Scott – which was auctioned in Los Angeles in January for $14,000 – has been revealed. The West Australian this morning said it was the WA State Library. The letter will be on display for the next three weeks and is the latest Scott item to be stored to acknowledge his cultural and tourism importance to WA. Scott grew up in Fremantle after migrating with his family from Scotland. His grave draws fans from all over the world. His second ‘60s band The Valentines were signed to WA’s first record label Clarion. Other items catalogued are 1974 solo tracks and recordings with The Spektors, the Perth band he was part of between 1964 and 1966. Also catalogued are a series of books including Irene Thornton’s My Bon Scott, Clinton Walker’s Highway To Hell, Mary Renshaw, John D’Arcy & Gabby D’Arcy’s Live Wire, Jesse Fink’s Bon: The Last Highway, Neil Daniels’ AC/DC : Early Years With Bon Scott and J. P. Quinton’s Bad Boy Boogie. 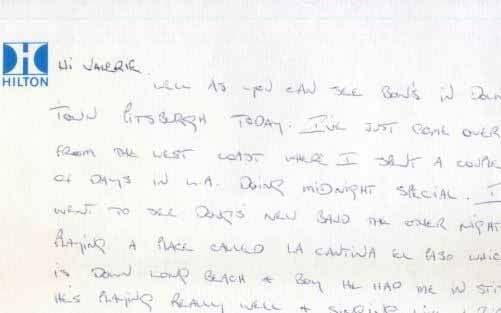 The 1968 letter was written on three pages of Hilton stationery on the Pittsburgh stopover during AC/DC’s Powerage tour. It is important as it reflected a time when the band was touring incessantly and cracks were showing in their psyche. Scott unburdens himself to a girlfriend Valerie about his heavy boozing and financial troubles, and heavy mental stress of himself and drummer Phil Rudd.